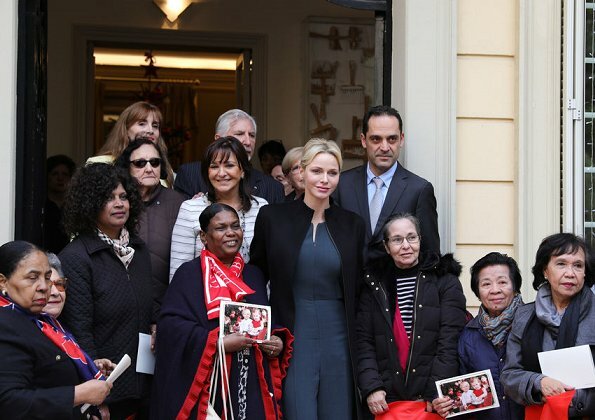 On December 15, 2017, Princess Charlene of Monaco attended the parcel distribution at the Monaco Red Cross. 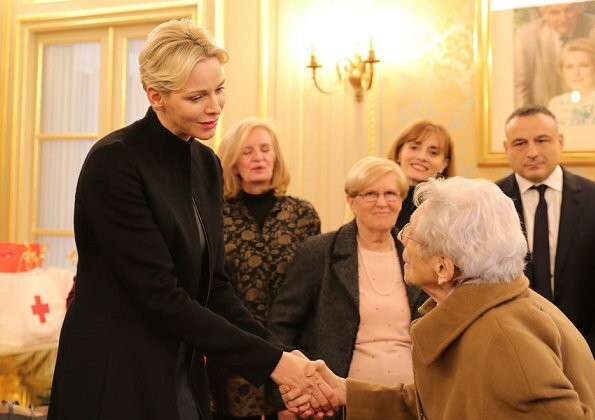 Princess Charlene presented the annual Christmas gifts to the elderly people at the Red Cross headquarters in Monaco. I like Charlene but i no not understand why she cant speak french good enough and why she doesnt work for the Monaco people. She says shes "a home mother" but if thats So, than she shoudnt have royal titles. I feel now that the kids are gowing up, she could devote more time to Monaco. She can do great things if she wants to. Monaco is a very small country very particular, it is different from other .. She works for her Foundation. Since 2012, 149 projects have been developed in 33 countries,410,000 beneficiaries, mostly children. Not saying thats not good, but thats not working for Monaco. Her foundation works outside of it. And with all respect lets not forget that the staff are the ones doing the hard work. I never said her foundation didnt. But is the staff doing the backstage work. I think they deserve the Credit. Plus she doesnt cup ribbons, visits hospices, support charities in Monaco etc etc. Charlene is patron to Autism monaco, Red Cross monaco. We have seen her attend these events. she cut ribbon for new stabucks, christened a ship; the seven seas explorer. It is not easy to learn another language when you're an adult. I'm sure she does enough for the people of Monaco. Yes but french its not a hard language to learn. It may take you some years but its doable. It has been almost 7 years and she cant remotely speak french. Clearly shes not trying. Hey, Charlene speaks French. She made a full speech on Albert's 10th anniversary in French. video is available on youtube. Elle a Lu un discours ,ce n'est pas parler ,c'est lire .Je dois lire une vingtaine de langues..
Winnie. She trained that speach. All the interviews are assignment she gás been a part of are in english. Thank you Helena. Thats what im talking about. Not everyone has an affinity for languages. Perhaps Charlene has tried to learn French and has been unable to fully grasp the language. Lovely pictures - she looks very elegant, I like her hair like this. I find it strange to comment on how little does for Monaco at a time when we've seen her at least once a week for a couple of months. She said she wanted time with the twins, now they're a little older and going to nursery she is appearing more. As to the French it is difficult to learn a language as an adult but she has lived there for over a decade with access to the best teachers - I think she really isn't a linguist despite her best efforts, her comprehension has improved so all is not lost. I think she looks very elegant, but to me it lacks a little colour belt. Exactly (!) the same expression in every photo. Odd. Yes, because she cannot move her plastic-surgerey-face. That much for her "beauty". Inderdaad je ziet haar nooit lachen. Lijkt wel of ze een masker op heeft. Jammer want vroeger zonder botox en fillers zag je een vrolijke lach. straks als de kinderen groter zijn ,dan leert ze het automatis!!! Yes, the hair is not the best style for her, anyway: lovely! Speaking of languages, although that really has nothing to do with a fashion blog, do Mary the Australian and Marie the French speak Danish? To me, that sounds more difficult to learn than French, and they were both adults when they married the Danish princes. Mary definitely speaks fluent Danish now. She did learn it and gives speeches and chats easily with Danish people at events. Her 4 children speak both Danish and English. I also think that Marie has learned Danish but I am not as sure as I am about Mary. I don't know for sure but I imagine that in Monaco people speak just as much English as French? And if everybody speak English then perhaps it's difficult to find the will to learn French? I think as the kids grow up she will learn more of the language through them. Personally I prefer when people speak the language of the country they live in, but I don't know how the people of Monaco feel about it, it seems to be a very international place.